Dogs like mountain climbing, to exercise its ability to walk and run, climbing makes the dog muscles more strong. Mountain climbing, of course, also benefits to the dog owners, your cardiopulmonary function and body coordination ability can be strengthened, And more importantly, mountain climbing is a good way to lose weight! 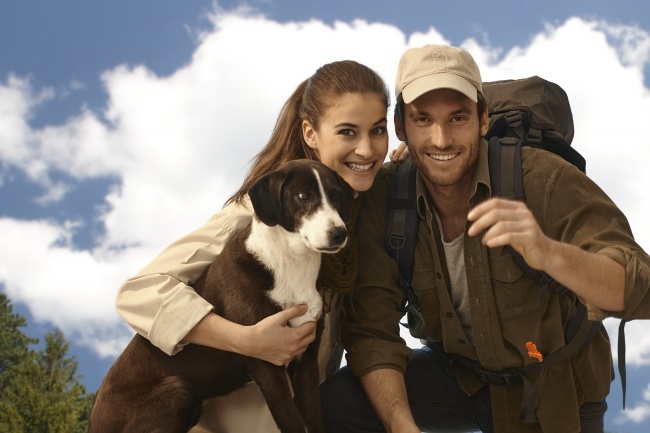 If your dog likes excitement and love adventure, then bring it to climb the mountain. But hiking with a dog is different than hiking with another person. It adds layers of complication and responsibility, too. From choosing dog-friendly trails to etiquette to ensuring your four-legged buddy stays safe, we’ve got tips about dogs on trails. Before you set foot on a trail, make sure your dog is trained and can be trusted to behave when faced with other hikers, dogs and wildlife. Always carry a leash, even when it is not required. Situations may arise that warrant leashing your dog. Don’t count on finding water along the trail. Pack enough for the entire day. A good rule of thumb is three liters of water for your dog’s day hike. Keep your dog well fed on the trail, because she will burn more calories than usual. Bring extra snacks in case you get lost and need to spend the night in the woods. Be courteous and leave the trail as you found it. Packing out your dog’s poop is the best etiquette – or bury it as you would your own waste (200 feet away from the trail and water sources). Make sure your dog is properly identified with tags should she become separated from you. Put a photo of your dog in your pack. Let your dog carry her own treats and water. Check that packs have reflective areas for night hiking and are padded for a comfortable fit. Includes gauze pads and tape in case of cuts, a couple of bouillon cubes to encourage the dog to drink if she’s getting dehydrated, and antibiotic cream for dressing wounds that might be infected.